I am actually bubbling with excitement writing this review. I have just finished this book and I feel like change is afoot and this book may well be the catalyst. The mainstays of modern parenting books, particularly ones with a sleep focus, are sleep training, routines and schedules. They are full of charts and prescriptions of, ‘your baby SHOULD be doing this by X age …’. They are full of scaremongering about creating ‘bad habits’ and the importance of a baby getting X amount of sleep so that they develop properly. Sleeping Like a Baby by Pinky McKay however, does none of these things. You can feel the warmth, the understanding and dedication Pinky has put into this book. She knows the importance of connecting with mothers and helping them stay connected to their baby. It is an easy read. There are wonderful anecdotes from mothers dotted throughout the pages, helping you hear and recognise yourself and your little one in other people’s experiences, too. You will not feel alone in your sleepless struggles after reading even a portion of his book. 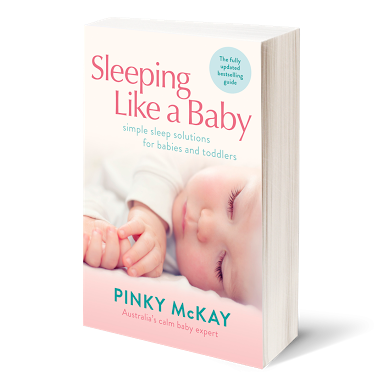 This new updated edition is brimming with useful, up to date evidence based information regarding normal infant sleep and Pinky has done a magnificent job bringing the data to you in manageable, sleep deprived mama friendly language. Pinky has covered thoroughly so many of the questions we as mothers ask ourselves as we wade our way through this weary season in our lives. The words of this book have the power to change the conversation around Baby Sleep for the better. If this book became THE book that was recommended routinely at antenatal classes or by midwives, MCHNs and GPs or given as a gift at baby showers, I would happily predict we’d see a swift decline in the amount of anxiety seen in mothers around their child’s sleep patterns and the way the mother responds to her child. This book is accessible. It is speaks to all mothers and treats them with the respect they deserve as the person who truly knows what is best for her child. Sleeping Like a Baby is also a gift to all the babies of those mothers lucky enough to read its pages. These babies will be understood, respected and responded to with tenderness and confidence by mothers who know that they are doing this mothering business beautifully, even if their baby is wakeful. Do yourself a favour mamas and invest in a copy today!